In an effort to discourage crime, vandalism, and dumping on their street corner, an Oakland resident set up a small Buddha statue that his wife purchased from Ace Hardware. He was not religious, just fed up and thought the Buddha might help dissuade the trashing of his block. The statue worked, and it also had an unexpected effect. Neoclassical Revival mansion and set of horror cult classic Phantasm. 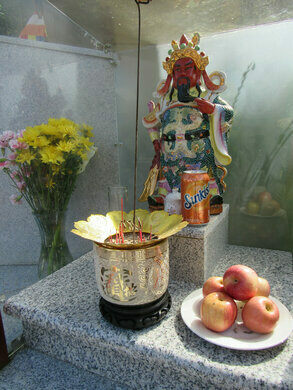 The humble statue wound up attracting dozens of Vietnamese immigrants in the area who came to pray and provide offerings to the newly installed Buddha. The Buddhist community embraced the statue to such a degree they also began making improvements and extensions to the shrine: building a covering for the Buddha, painting the statue, hanging framed pictures, adding additional statues to the corner, and even hiding a speaker softly playing music. Not all of the neighbors were happy about the new attraction and the worshipers’ morning visits though, and after complaints the city said it would remove the Buddha, despite its positive effects on the cleanliness of the corner. The neighbors and worshipers fought back and began a successful campaign that saved the Buddha from removal. Located on the corner of East 19th St. and 11th Ave. Please be respectful of shrine and neighbors. A restored 1920s cascade stairway provides one of the best views of Oakland's Lake Merritt. This mysterious series of teeny guerrilla installations sheds a whimsical light on street art in Oakland. A temple devoted to inner esoteric mysteries located in a California commercial strip. A shrine honoring a legendary ghost bride lies within this vibrant temple. The tower claims to be the world's only pagoda made entirely from Myanmar's lucrative gemstone.